One of three species of marlin, this is the most widely known and fished for. Actually, "Makaira" wouldn't be a bad name for a girl, would it? Hmmm. Gotta talk to the wife on that one. 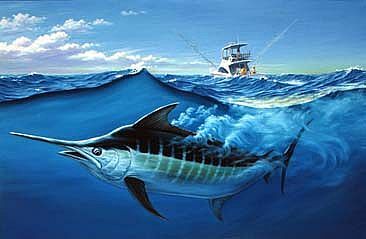 The Atlantic marlin is a native inhabitant of the Atlantic Ocean. There are a couple of other species that live on the other side of the USA in the Pacific and all the way into Asia and the Indian Ocean. This one is called the Indo-Pacific Marlin (as if you couldn't figure that out on your own). Typically, these large fast moving fish will be found in deep open water where the climate is temperate or tropical. Known among anglers as the "gearhead" of the fish world, these babies have a powerful swimming engine and have been clocked at over 50 MPH! This is helpful as they migrate to the equator in winter and away again in summer. It is believed that some migrations may encompass the WHOLE ATLANTIC OCEAN! This species spawns through parts of summer and fall. A single female can emit upwards of 5,000,000 eggs (each approx. 1mm in size) at once and can spawn several times in one season. The young are what is called "planktonic" and basically float at the discretion of the ocean currents, growing and maturing along the way. Sexual maturity is reached between 2 and 5 years of age. They are a deep blue, sometimes black, on top with a light colored underside. There is the characteristic "bill" that resembles a spike and the tail is crescent-shaped. The males are always smaller, so all the trophies you see caught are females. Males will grow to a maximum of about 350 pounds while the females reach a whopping 1200 pounds! I guess that "Hell hath no fury like a female Marlin hooked". The current world record is 1189 pounds caught off the Azores Bank near Faial. Atlantic blues solely eat other fish, but may dine on a squid or small octopus here and there. Mainly mackerel tuna varieties, though. The marlin will swim at high speeds through a school of small fish just whacking and slashing that sharp bill to and fro. Then they will return immediately and gorge on the dead and bewildered fish. Very aggressive and very serious about their eating. Marlin can be enjoyed in many ways. Due to the size of the fish, steaks are the order of the day, and grilling is the preferred method. Broiled, bazed and baking have been seen to work well, too. One thing about this fish is it NEEDS a sauce, folks. Most chefs and cooks will incorporate liquor for added flavor and the fish seems to like it as well. 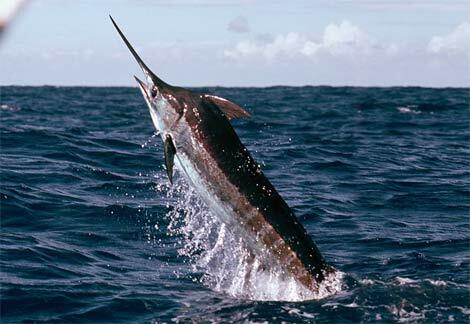 Marlin have been confused with swordfish and sailfish because of that blasted bill sticking out of their face. The one sure fire way to identify the Atlantic Blue Marlin is the coloration. They're blue on top, hence the name BLUE Marlin. Sailfish have a dorsal fin that goes all the way from head to tail, like a sail. Need I say more…Swordfish have a longer bill and the dorsal and pectoral fins are like a dolphin's.